It’s the 21st Century. We’re all connected. It’s absolutely the norm at this point for information to travel across the world in mere seconds. Therefore, it only makes sense that a hydroponics system should feature technology that allows people around the world to communicate freely, sharing growing ideas and information. Such is the case with the recently-developed kickstarter project Microexperimental Growing indoor greenhouse system (that’s MEG for short). 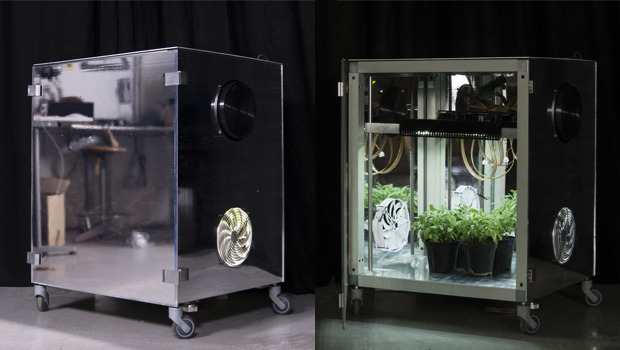 Created by a team led by lighting experts Carlo D’Alesio and Piero Santoro, the MEG indoor greenhouse utilizes Arduino-based software to gather growing information. A small board mounted inside a personal-sized greenhouse monitors the environment, gleaning information that is then fed back to a computer. Users will be able to adjust a variety of parameters including humidity, soil pH, temperature, and light-cycles. The MEG indoor greenhouse is described as a “household-appliance-like” user experience, with the “overall power consumption of a standard flat tv”. I, for one, love this comparison; I like to think that the system has the potential to make hydroponic growing as second nature as (yet considerably less mindless than) watching television. Automation of the growing system isn’t the only technological aspect of MEG, however; the software will allow growers to create a user profile on “MEG social”, which will in turn allow them to share their current growing conditions and progress. The idea is that, with freely-exchanged growing information, growers will become indoor gardening experts. The sophisticated and well thought-out system provides options to contact others based on location or their ranking as a grower or developer, making it easy to seek out the most relevant information. The open-source nature of the MEG indoor greenhouse isn’t limited to free exchange of growing information, however. While both the software and hardware of the MEG are seemingly well-developed, users will also be able to improve on both of these aspects. Thus, although the system isn’t explicitly designed for soilless growing, it can be easily modded to accommodate pretty much any soilless method one can think of. By closely integrating the indoor growing experience and open information sharing, MEG is a growing system that’s progressive and has the potential to generate a wealth of new ideas that will benefit indoor and soilless growing for years to come. Check out their kickstarter for more information and feel free to contribute! Without backers, this game-changing project may not come to fruition.